Greetings! 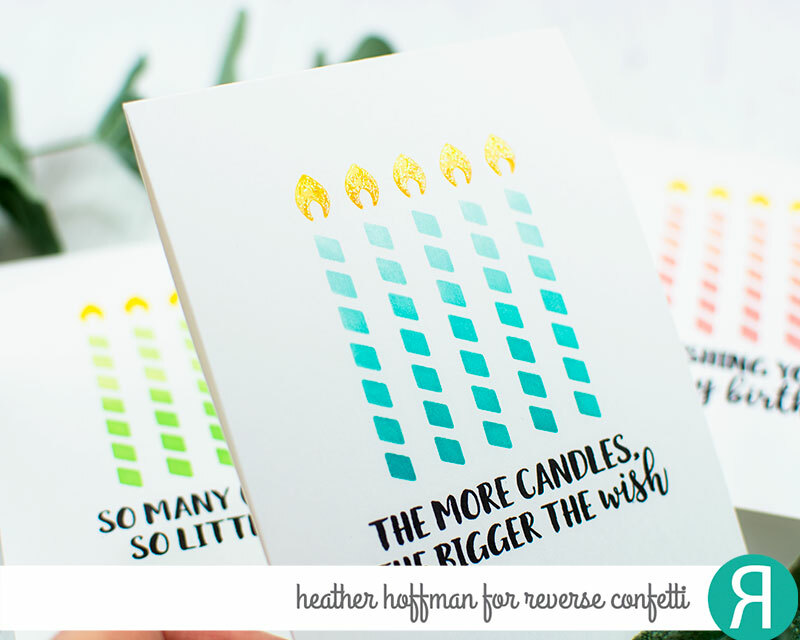 Heather here today to share a bright and fun card featuring a holiday stamp set stretched to make a completely different card! 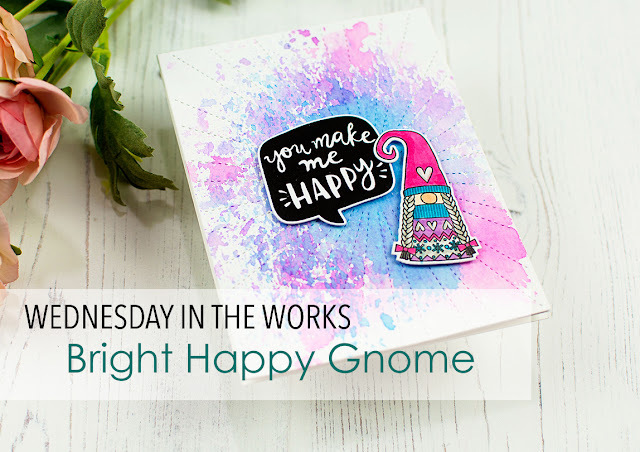 I used one of the darling gnomes from Holiday Gnomes paired up with a sentiment from Figure of Speech and a background created with Stitched Rays Cover Panel and distress inks! I love how splattery and fun the background is - and the cover panel adds just the right amount of texture and interest! The distress inks used were Wilted Violet, Mermaid Lagoon, and Picked Raspberry. Hi Fetti' friends! 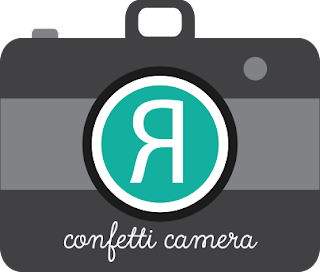 It's Amy here today with this week's issue of Confetti Camera. I am sharing two cards that are different but the same! I decided to go with cards for new babies......a girl and a boy. It really is easy to create cards like this with just a few changes! 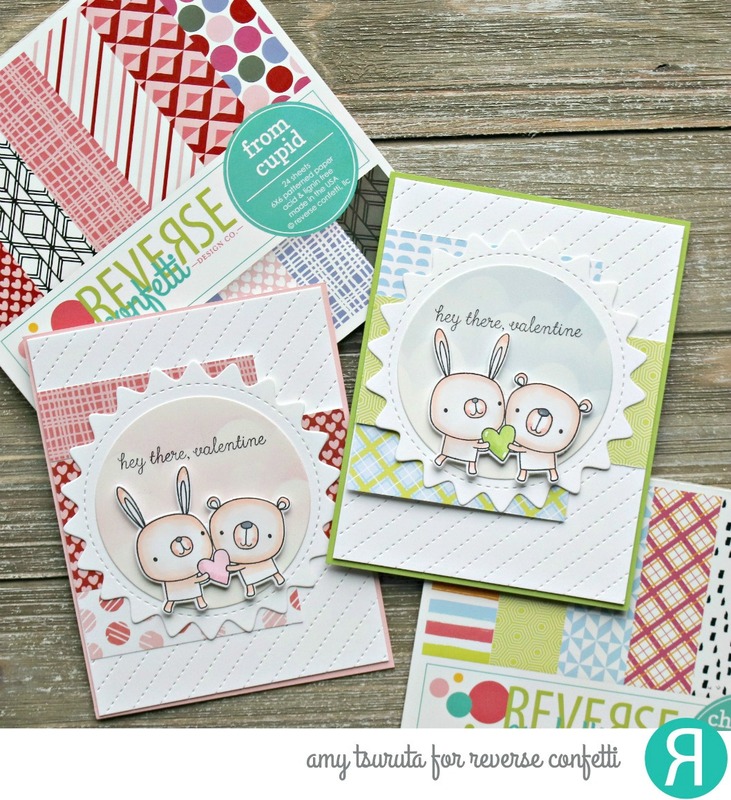 I started with the adorable bear and honey pot images from Honey Bear. They both were stamped and Copic colored the exact same way. 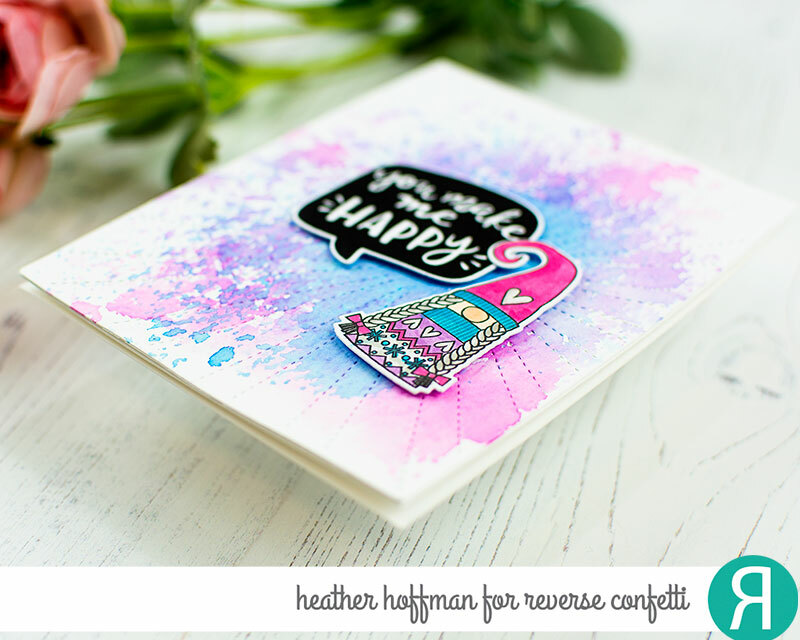 Both cards use the Hex Cover Panel Confetti Cuts and a sentiment from Whole Lotta Happy. For the baby girl card, I chose a traditional 'pink' for my background by using a pattern paper from the From Cupid 6x6 paper pad. I wanted the pattern to show behind the cutouts in the Hex Cover Panel Confetti Cuts. After die cutting my panel, Coral Dye Ink was blended over the panel in the upper left area and fading out. I stamped a sentiment strip with 'Happy new baby' and cut it at an angle. All the images were added with foam adhesive. A few coordinating pink gems were added. For the baby boy card, I chose a more 'teal' color by using the pattern paper from the Winter Solstice 6x6 paper pad. What I like about this pattern is that it is more solid and gives the baby boy card a bit of a different look. The same sentiment strip was added over the Hex Cover Panel Confetti Cut panel (which was ink blended with Iced Aqua Dye Ink) with foam adhesive. To finish, I added some coordinating gems but placed some of them on the pattern paper so they weren't so noticeable. It is a boy card after all! Good morning! Heather here today to share a simple trio of one layer birthday cards featuring the fun Candles Confetti Cuts used as a stencil and paired up with Birthday Wishes stamp set for the sentiments - not to mention lots of fun Reverse Confetti Dye inks! 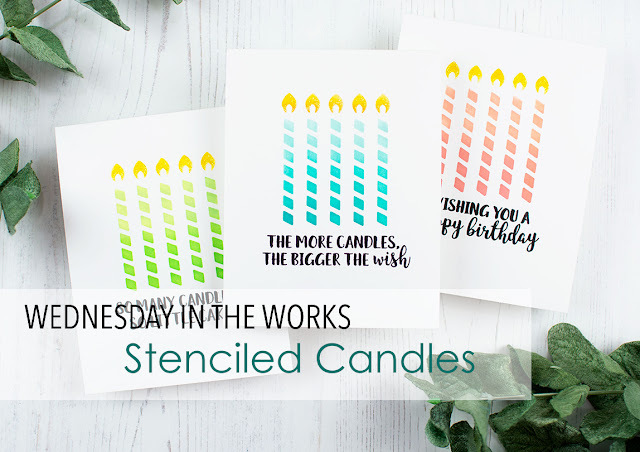 I used Bumblebee and Tangerine inks for the candle flames, then 3 different combinations of dye ink for the candles - Iced Aqua and RC Aqua, Pistachio and Grass, and finally, Bellini and Coral! Hi, ‘Fetti Fans! 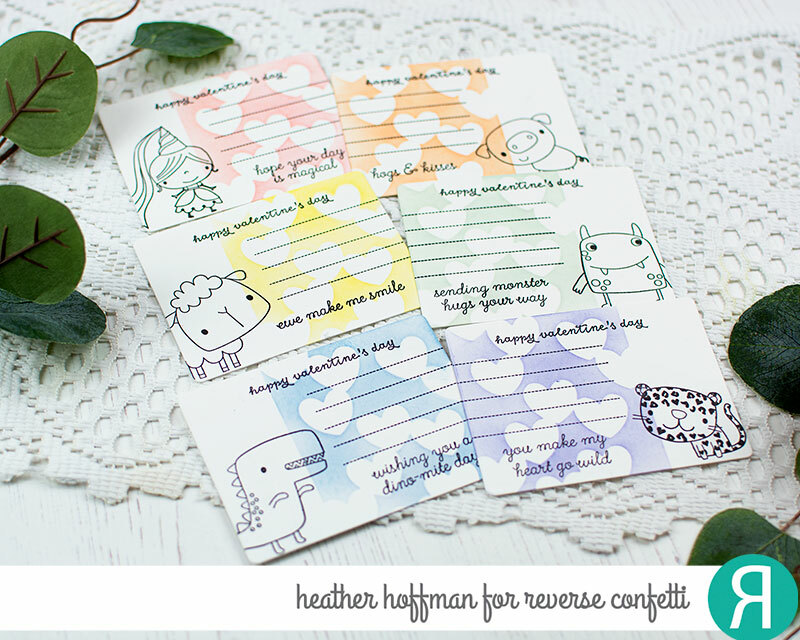 Kathy here sharing a project for February’s Confetti Camera: Two Versions. Isn’t getting the most out of your craft products by using them in different ways the best?! These two cards were created with basically the same stamps and dies. 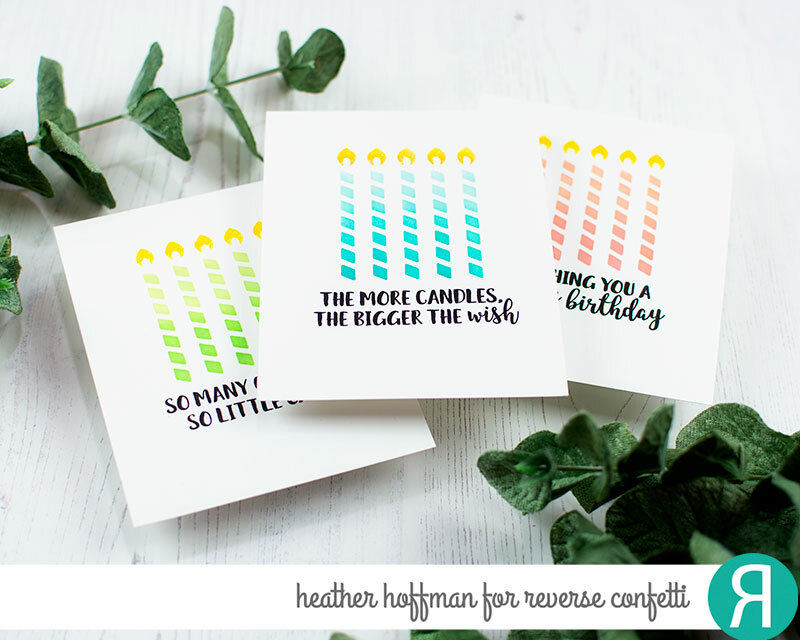 By changing colors and sentiments, they are for different occasions! The first card is for a teacher. I layered Midnight cardstock to the card base then cut Salsa cardstock using the ABC Cover Panel. The Grid Stitched Tag is cut from Cloud White cardstock and the tab from Bumblebee cardstock. As a backdrop for the adorable koala from Bear Hugs, I cut Midnight cardstock using the smaller Stitched Squares Confetti Cuts; Bumblebee cardstock for the sun and the ‘for my teacher’ sentiment is from the Honey Bear set. The second card is for a baby or baby shower. For this one, I layered Lime Green cardstock onto the card base and cut Buttercup cardstock using the ABC Cover Panel. The Grid Stitched Tag is cut from Baby Blue cardstock and the tab from Cloud White cardstock. Here, the sweet little koala from Bear Hugs was layered onto Lime Green cardstock using the smaller Stitched Squares Confetti Cuts; Buttercup cardstock for the sun and the ‘welcome, little one” sentiment is from the Bear Hugs set. 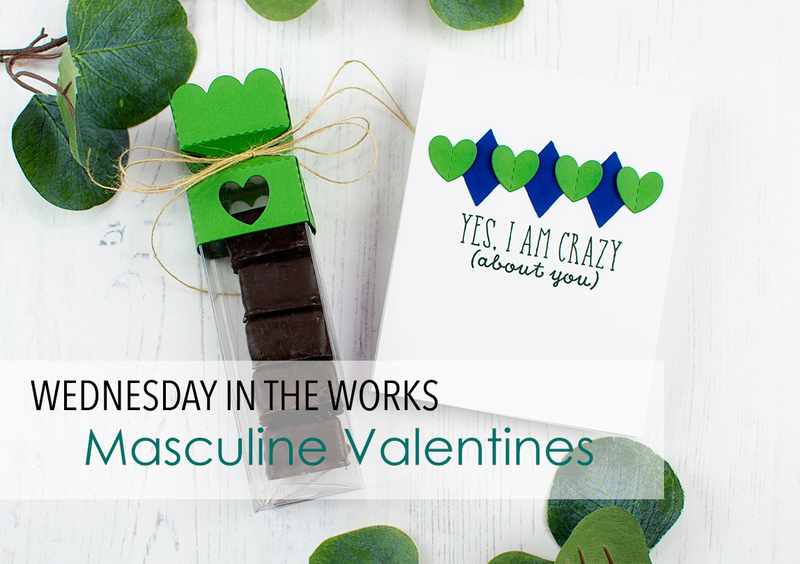 Hello and welcome... Heather here today with a simple and fun masculine Valentine duo! Just by keeping the designs simple and using non-traditional Valentine colors, this set is perfect for the guy or non-pink loving teen girl in your life! 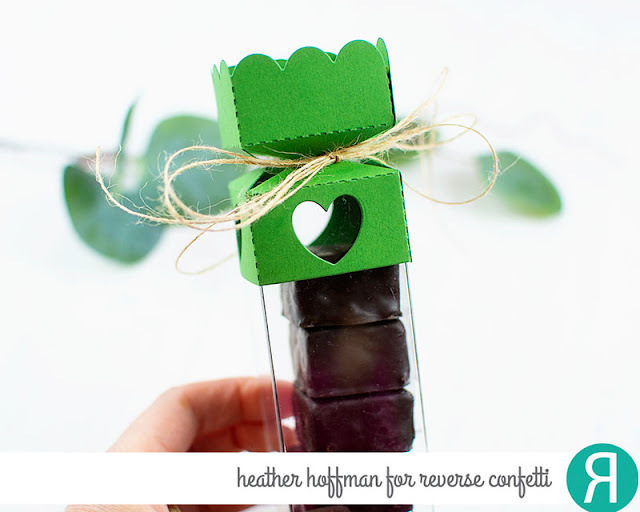 My treat packaging was created with Treat Tube Topper Confetti Cuts, and of course, coordinating Treat Tubes. I also used XOXO Hearts Confettu Cuts to cut out the heart windows - and all the negative cuts worked together to make the matching card as well! 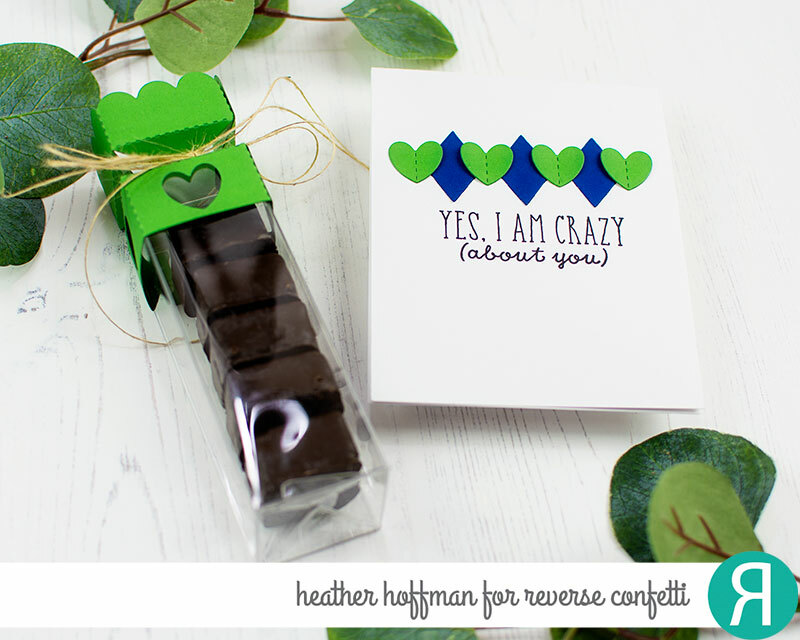 The two cardstock colors were Avocado and Navy - love how they work together! 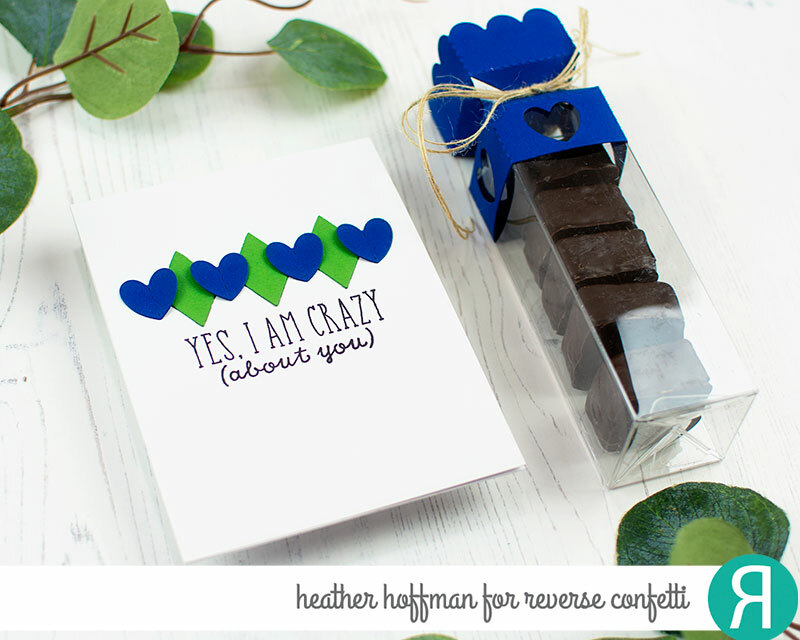 Sentiment on the cards is from Crazy About You - a fun older Valentine's stamp set full of quirky sentiments like this one! Greetings, 'Fetti Fans and welcome to this month's creative hop. Myself and the Confetti Crew have a variety of projects to share and inspire you. You'll find a full hop list at the bottom of the post. I started by cutting 2 GRID STITCHED TAGS from PREMIER POLAR WHITE cardstock. From there, I cut a heart out of one using the smaller heart from the PATTERNED HEARTS Confetti Cuts die set. On the other I created a diagonal rainbow with SALSA, FLAMINGO, RUST, SUNSHINE, LIME GREEN, RC AQUA and ROYAL PURPLE cardstock. Aren't those colors just fab!?! I created a shaker by popping up the tag with the heart cut out of it. My secret for a tall shaker...FOAM WEATHER STRIPPING! You can pick up a big roll at Home Depot for less than $5!! TTo finish it all, I added the sentiment from the PATTERNED HEARTS stamp set and the LEAD cardstock heart (created by using both hearts in the PATTERNED HEARTS Confetti Cuts die set). On the top, I added some striped ribbon from my stash and gray twine. Time for me to send you on your way to see what the Confetti Crew has to share with you today! Hello 'Fetti Fans! It's Amy T here, sharing my version of this week's Confetti Camera, Two Versions. I created two Valentine's Day cards, one with traditional colors and the other featuring non-traditional colors. 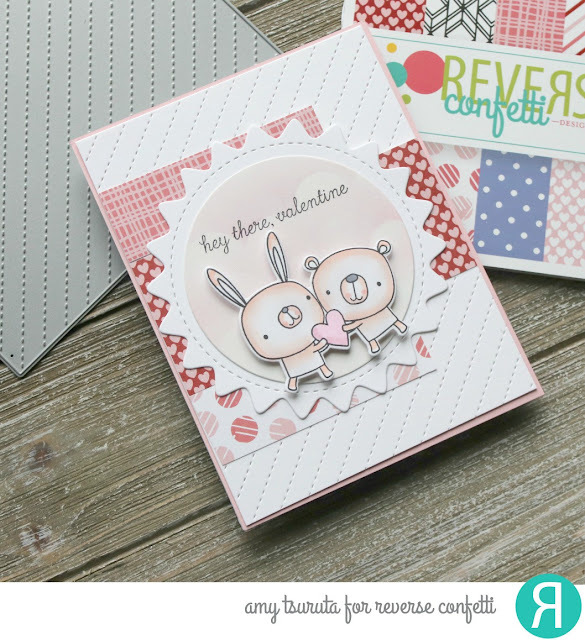 Both projects feature the Heart Pals stamp set and the Diagonal Stitches Cover Panel Confetti Cuts. You might also recognize the Boo To You Circle Confetti Cuts. Let's look at the traditional palette design first. 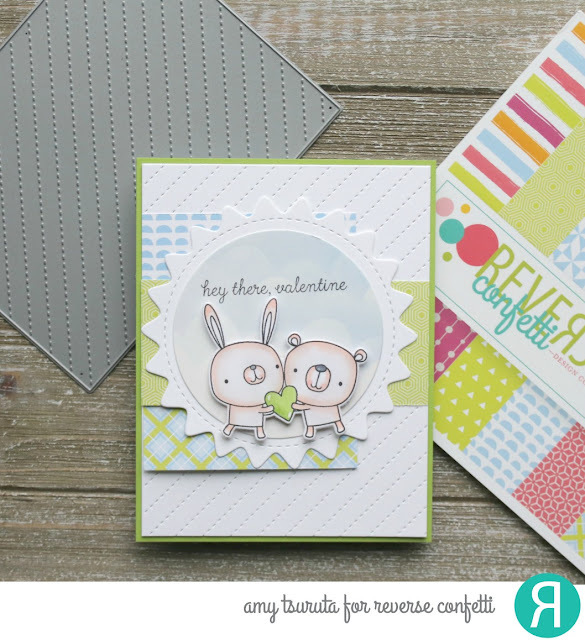 Each project also includes a cloudy background that was done using the Wonky Double Edge Scallop Border Confetti Cuts. I used Premier Polar White cardstock and cut one out to use as a stencil with Piggy Bank ink. That ink also coordinates with the solid base panel. The pattern paper is From Cupid. While using the same card sketch design, I used Baby Blue ink with the Wonky Double Edge Scallop Border Confetti Cuts on my Non-Traditional version. My card base is Lime Green and the paper pad I used is Cheerful and Kind. Do you notice that the hearts coordinate with the base panel color? By using the same design, both cards came together fairly quickly. I'm a big fan of the use of non-traditional colors on cards so this was super fun. I'm totally set with my kids' valentine's. Hello Fetti Friends! It's Kelly here today with this installment of the Confetti Camera! I am sharing 2 cards that are the same, but also different. I decided to create some "Just a Note" designs with one being on the warm color scale and the other on the cool color scale. It is amazing how switching the colors really changes the feeling that your design can convey! I made each of the cards simultaneously which makes everything go so much quicker! 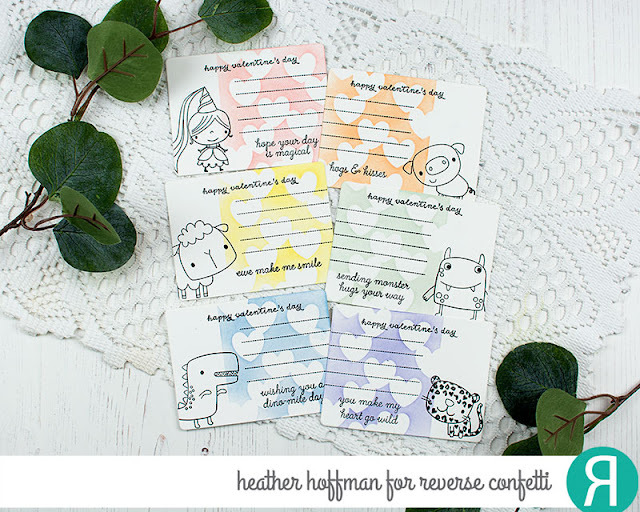 You could create a whole set of identical note cards very easily but have them feel very different just by switching up the color palette. To begin, I stamped all of the images I would be using from the Tall Blooms stamp set and colored them with Copic markers. For the red/yellow card I chose greens that have more yellow in them and for the blue card, I chose greens with more blue. If you are struggling to decide what would be more warm or more cool, just pick the color that has more of the hue you are needing. Since all of the colors are made using the Primary colors, it is easy; for instance, a purple with more red in it would be on the warm side and a purple with more blue in it would be cool. Ideally, I would have used a spearmint type color for the blue card, but I didn't have the right markers! Looks like it's time for some shopping! Ha ha! Once they were all colored, I used the Tall Blooms Confetti Cuts to die cut everything. I added some Wink of Stella for some additional shine to the die cut pieces. I set them aside and got to work on the rest of the card elements. I used the Polka Panel Confetti Cuts as a background for the flowers. I layered each one onto Premier Polar White cardstock. I chose Mist cardstock for the cool card and Sand cardstock for the warm card. The sentiment is from the Lots To Say set and is heat embossed in gold for the warm card and silver for the cool card. At this point, I gathered the flower/foliage images into a bundle and attached them to the die cut Polka Panel using foam squares. I layered the sentiment over the top and attached a bit of button twine using liquid glue. I used a jute color for the warm card and white for the cool card. Next it was time to pick some pattern papers; this is always my favorite! For the cool card, the large piece is from the Warm Heart 6 by 6 paper pad with a little strip from the Fun Times 6 by 6 paper pad. I adhered them to an A2 white card base and used my sewing machine to add some zig zag stitching down the left side for some additional detail. The warm card was assembled in the same way, but the large piece is from the Pattern Play 6 by 6 paper pad and the small strip is from the Cue the Confetti paper pad. It is amazing how choosing the right papers can make such a difference with the overall feeling of the card. I've been desperately needing cards just like this so I am exited to put these in my stash! 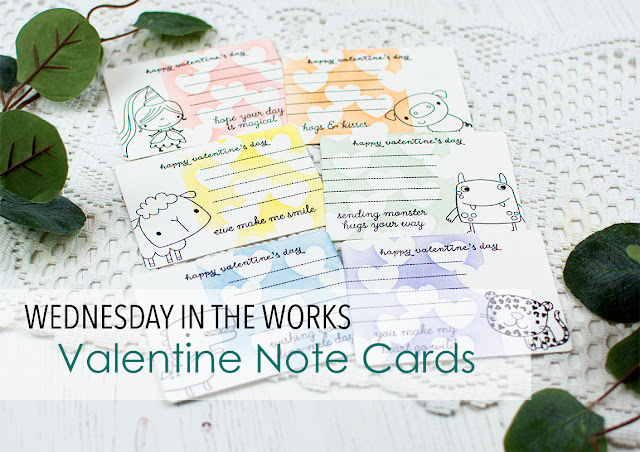 I hope you'll try creating some similar, yet different cards by changing up the colors, like I have shown today! Have a wonderful week! Greetings! 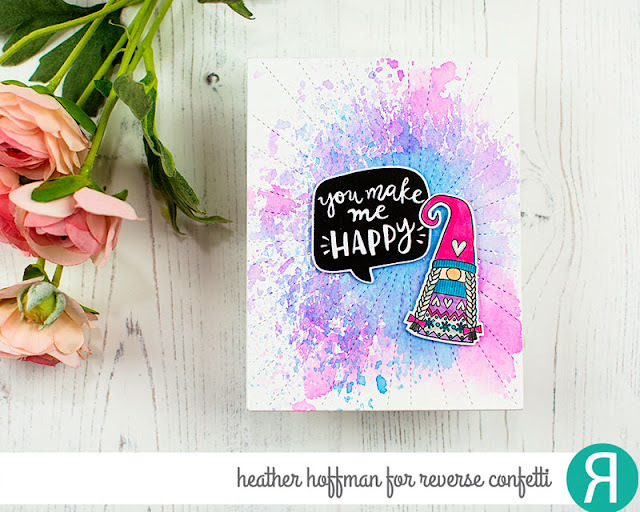 Heather here today to share a fun and sparkly card featuring a triple heart shaker element, each one filled with glitter! 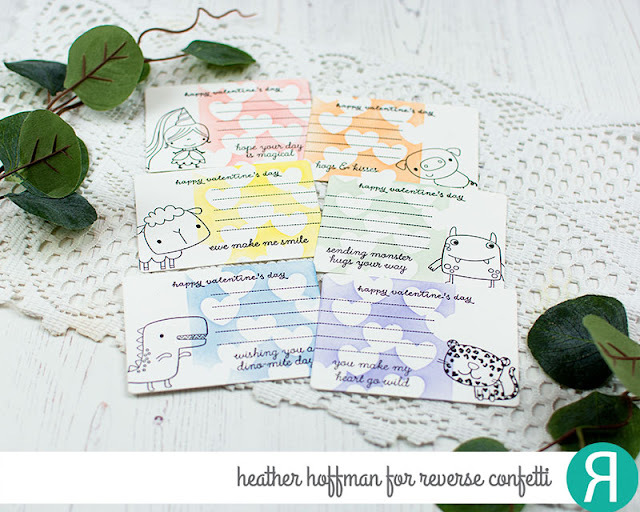 I used such a wide variety of Reverse Confetti Products - the ink colors I used are Coral, Peach, Buttercup, Seafoam, Baby Blue, Wisteria, and Midnight for stamping the images and sentiments. I used Kindness Cards Confetti Cuts to die cut the notecards and Kindness Cards Stamp Set to add the lines for writing notes on, Falling Hearts Panel Confetti Cuts for the stencil, and Crazy About You for the Happy Valentine's Day sentiment. The images and other sentiments came from All About Ewe, No Tomorrow, Magical Day, Heart Spots, Monsterous, and Cured. What do you think? Would love to hear which is your favorite?!?!? Hello and Happy February, 'Fetti Fans! It's always nice to let someone know that you're happy for them, proud of them and/or have their back. We can't wait to see what you come up with for this month's challenge. The SYS link list will be open from the 1st until noon CST on the 27th of the month. Click the "Play Along..." button on our sidebar to go current link list post. Greetings, 'Fetti Fans and Happy Thursday! Maureen, please email info@reverseconfetti.com to claim your prize!